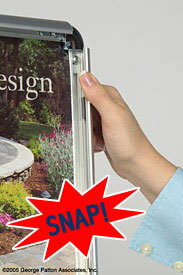 We sell this free standing snap frame with an acrylic literature pocket! This free standing snap frame serves a double purpose. 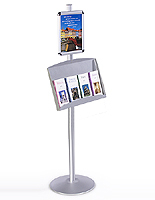 Not only is the snap frame a poster stand frame system, but it is also a literature rack. 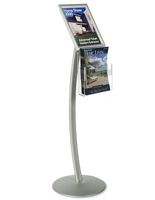 An acrylic brochure pocket attaches to the free standing snap frame so that you can make literature readily available to your customers. Like other poster holders, this snap frame is an ideal poster frame display for hotels, travel agencies, or even offices. 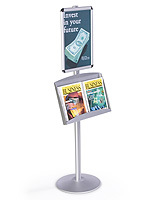 The snap frame poster stand is constructed from satin aluminum, accenting its very sleek and elegant European design. Setting up the free standing snap frame is a breeze. All four sides of the frame snap open for easy front loading. The free standing snap frames have rounded stylish corners. These corners are both an aesthetic and a safety feature to the sign frames. You can feel secure no matter where you set up the snap frame poster stands because the corners present no potential danger. 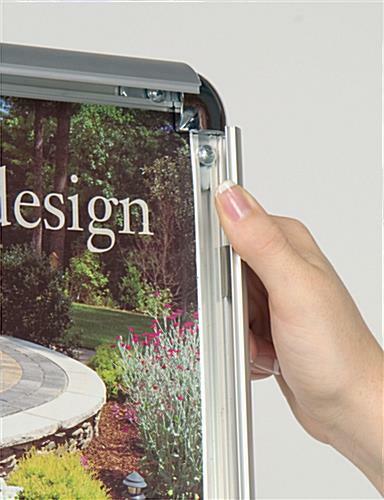 The acrylic literature pocket comes detached from the frame system. 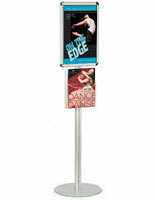 Simply, hook on the acrylic 'lip' over the metal bar on the poster stand's pole. 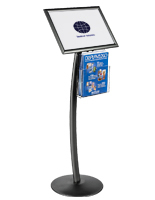 A frame system such as this free standing snap frame is a simple, yet fully functional poster stand. In a matter of seconds you, are ready to load your promotional materials into the display equipment! The free standing snap frame stands 54" tall. The circular base is weighted to support the frame system. 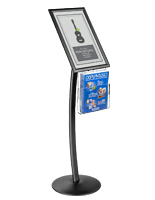 Poster holders like this snap frame take up minimal floor space and therefore allow you to market to your customers without large, obstructing displays. Buy a free standing snap frame online from us today! *Please note: single sheet flyers will flop over in this pocket. 14.0" x 56.0" x 20.0"
8.6" x 11.8" x 2.1"